Despite the fact that Cyprus is a small state in the international system, with all that this entails in the exercise of diplomatic practice, the Republic of Cyprus (RoC), particularly in the last ten years, has taken several initiatives for activities that fall in the realm of defence diplomacy. 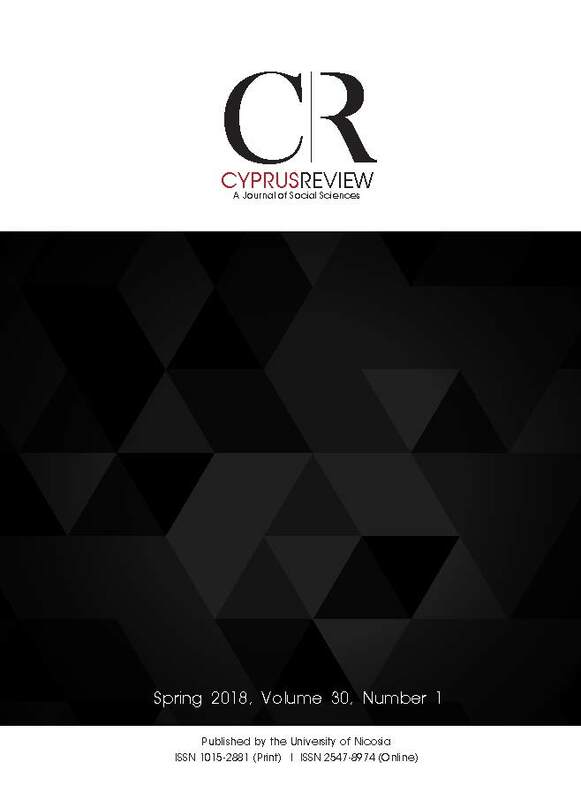 The overall objective of this article is to examine the bilateral defence diplomacy initiatives of the RoC with its neighbouring states in the Eastern Mediterranean, such as Israel, Eg ypt, Jordan and Lebanon in the period 2010 - 2017.
dynameis-stin-kypro-2017-the-military-forces-in-cyprus-2017, accessed 1 May 2017. Arutz Sheva, (n.d.) ‘Israel and Cyprus to Improve Military Cooperation’. Israel International News, Available at http://www.israelnationalnews.com/News/Flash.aspx/267521#.VQ6hgY7kfTN, accessed 10 June 2017. The Associated Press, (2017, November 30) ‘Cyprus to help Lebanon build Mediterranean Sea rescue center’, Defense News. Available at https://www.defensenews.com/naval/2017/11/30/cyprus-to-help-lebanon-build-mediterranean-sea-rescue-center/,accessed 10 June 2017. Benari, E., (2013, April 10) ‘Israel and Cyprus to Hold Joint Military Exercise’. Israeli Frontline. Available at http://www.israelifrontline.com/2013/04/israel-and-cyprus-to-hold-join.html, accessed 10 June 2017. Bengio, O. (2004) The Turkish-Israeli Relationship Changing Ties of Middle Eastern Outsiders. New York, Palgrave Macmillan. Bitzinger, R. (2011) ‘US Defence Diplomacy towards Southeast Asia’, in Bhubhindar, S. and Seng, T. (eds), From ‘Boots’ to ‘Brogues’: The Rise of Defence Diplomacy in Southeast Asia. Singapore: S. Rajaratnam School of International Studies: 104–115. Central Intelligence Agency, (n.d.) CIA World Factbook. CIA.gov. Available at https://www.cia.gov/library/publications/the-world-factbook/geos/eg.html, accessed 27 March 2012. Cheyre, J. E., (2013) ‘Defence Diplomacy’, in Cooper, A., Heine, J., Thakur, R. (eds), The Oxford Handbook of Modern Diplomacy, Oxford: Oxford University Press: 369–382. Christou, J., (2015, August 4) ‘Defence Minister Concludes Israel Visit’. Cyprus Mail. Available at: http://cyprus-mail.com/2015/08/04/defence-minister-concludes-israel-visit/,accessed 10 June 2017. Cottey, A. and Forster, A. (2004) Reshaping defence diplomacy: New roles for military cooperation and assistance. Adelphi Paper 365, London: Oxford University Press. Cyprus Daily, (2017, December 1) ‘Cyprus and Jordan sign bilateral military cooperation programme’, Cyprus Daily. Available at: http://english.cyprustimes.com/2017/12/03/cyprus-jordan-sign-bilateral-military-cooperation-programme/, accessed 10 June 2017. Cyprus Investment Counsel, (2016, August), ‘Lebanon-Cyprus’. Cyvestco.com. Available at http://cynvestco.com/wp/2016/08/21/lebanon-cyprus/, accessed 10 June 2017). Economist, The, (2012, February 18) ‘Israel and Cyprus - Getting Friendly, The Economist. Available at: http://www.economist.com/blogs/newsbook/2012/02/israel-and-cyprus. Geneva Center for the Democratic Control of Armed Forces (DECAF) (2007) Defence Attaches, DECAF Backgrounder. Globes, (2012, January 10) ‘Israel, Cyprus Sign Defense Agreements–Reports’, Globes[online]. Available at http://www.globes.co.il/en/article-1000714277, accessed 10 November 2018. Gold News, (2017, August 25) ‘Cyprus and Egypt Sign Program for Implementing Their Military Cooperation’. Gold News. Available at http://www.goldnews.com.cy/en/energy/cyprus-and-egypt-sign-program-for-implementing-their-military-cooperation, accessed 10 June 2017. Goodman, L., (1996) ‘Military roles past and present’. In Diamond, L. and Marc F. Plattner (eds), Civil–military relations and democracy. Baltimore and London: Johns Hopkins University Press: 30–43. Heather, E. P., (2012) ‘Defence Diplomacy in the Arctic: the search and rescue agreement as a confidence builder’, Canadian Foreign Policy Journal, Vol. 18, No. 2: 195–207. Israel Ministry of Foreign Affairs, (2013, May 7) ‘President Peres Meets with Cypriot President Anastasiades’. [Press Release]. Available at: http://mfa.gov.il/MFA/PressRoom/2013/Pages/Peres-meets-Cypriot-President-Anastasiades.aspx, accessed 10 June 2017. Ministerio De Defensa Espana (Spain) (2012) Defence Diplomacy Plan. Ministerio De Defensa Espana. Ministry of Defence (RoC), (2012, September 21) ‘Official Visit by the Minister of Defense to Lebanon and Talks with the Leadership of the Country’ [in Greek]. [Press release]. Available at http://www.mod.gov.cy/mod/mod.nsf/All/13D67786AACEEF55C2257D9E002A90CD?OpenDocument, accessed 10 June 2017. Ministry of Defence (RoC), (2014, February 11), ‘The Armed Forces of the Republic of Cyprus and the State of Israel hold a joint exercise named “Onisilos-Gideon”’. [Press release]. Available at http://www.mod.gov.cy/mod/mod.nsf/All/FF3E4C24E329CBC9C2257D9E002A91F6?OpenDocument, accessed 10 June 2017. Ministry of Defence (RoC), Joint Rescue Coordination Center, (2014, May 19) ‘Multinational Exercise “ARGONAUT 2014’. [Press release]. Available at http://www.mod.gov.cy/mod/CJRCC.nsf/All/CA73F1C8296FCDE0C2257CDD00457921?OpenDocument, accessed 10 June 2017. Ministry of Defence (RoC), (2015, November 3), ‘First official visit by the Egyptian Minister of Defense to Cyprus - A Memorandum of Military and Defense Cooperation signed’ [in Greek]. [Press release]. Available at http://www.mod.gov.cy/mod/mod.nsf/All/4A122751FA7BC502C2257EF2004AD506?OpenDocument, accessed 10 June 2017. Ministry of Defence (RoC), (2016, February 24), ‘First official visit by the Israeli Minister of Defense to Cyprus. An Agreement on the Status of Forces was signed’ [in Greek]. [Press release]. Available at http://www.mod.gov.cy/mod/mod.nsf/All/FDA813524FCCE376C2257F630041F07E?OpenDocument, accessed 10 June 2017. Ministry of Defence (RoC), (2016, February 28), ‘First official visit by the Cypriot Minister of Defense to Egypt’ [in Greek]. [Press release]. Available at http://www.mod.gov.cy/mod/mod.nsf/All/9F18BE51CF1750E9C2257F670057625F?OpenDocument, accessed 10 June 2017. Ministry of Defence (RoC), (2016, October 12), ‘Multinational Exercise Nemesis- 2016’ [in Greek]. [Press release]. Available at http://www.mod.gov.cy/mod/mod.nsf/All/0C3AE7527544D3F8C225804A004F877B?OpenDocument, accessed 10 June 2017. Ministry of Defence (RoC), (2017, March 22), ‘The “Onisilos-Gideon” exercise was successfully completed’ [in Greek]. [Press release]. Available at http://www.mod.gov.cy/mod/mod.nsf/All/C7DB27407F52D0C3C22580EC00227304?OpenDocument, accessed 10 June 2017. Ministry of Defence (RoC), (2017, April 12), ‘Minister of Defence meets with President El Sisi in Egypt - It was established Permanent Co-ordinating Committee on Defense Issues’ [in Greek]. [Press release]. Available at http://www.mod.gov.cy/mod/mod.nsf/All/F9546D3081EE3471C225810000570A92?OpenDocument, accessed 10 June 2017. Ministry of Defence (RoC), (2017, May 14) ‘Visit by the Minister of Defense to Israel as part of a series of visits to the Eastern Mediterranean’ [in Greek]. [Press release]. Available at http://www.mod.gov.cy/mod/mod.nsf/ All/9D90086B1F0F111BC2258121002313F8?OpenDocument, accessed 10 June 2017. Ministry of Defence (RoC), (2017, May 23), ‘Cyprus-Jordan had signed a Military Memorandum of Understanding’ [in Greek]. [Press release]. Available at http://www.mod.gov.cy/mod/mod.nsf/All/17D60BDAACF36E9BC2258129003FA5C4?OpenDocument, accessed 10 June 2017. Ministry of Defence (RoC), (2017, June 14), ‘The exercises “IASON 1/2017” and “KINYRAS-SAUL 2017” were successfully completed’ [in Greek]. [Press release]. Available at http://www.mod.gov.cy/mod/mod.nsf/All/D0788D0CE04FEC14C2258141001BF52E?OpenDocument, accessed 10 June 2017. Ministry of Defence (RoC), (2017, October 30), ‘Know-how and ... “Zastava” from Cyprus to Lebanon’ [in Greek]. [Press release]. Available at http://www.philenews.com/eidiseis/politiki/article/447991/technogosia-kai-zastaba-apo-kypro-pros-libano, accessed 10 June 2017. Ministry of Defence (RoC), (2017, October 30), ‘Official visit by the Minister of Defense Christoforos Fokaidis in Lebanon’ [in Greek]. [Press release]. Available at http://www.mod.gov.cy/mod/mod.nsf/All/933BB90296A53CA5C22581C9005548B8?OpenDocument, accessed 10 June 2017. Ministry of Defence (RoC), (2017, November 30), ‘Official visit by the Head of Jordanian Armed Forces’ [in Greek]. [Press release]. Available at: http://www.mod.gov.cy/mod/mod.nsf/All/45A7A94086E45DACC22581E90020F8A8?OpenDocument, accessed 10 June 2017. Ministry of Defence (RoC), (2017 December 3-14), ‘Military Exercises Iason, Nikoklis-David and Onisilos-Gideon’ [in Greek]. [Press release]. Available at http://www.mod.gov.cy/mod/mod.nsf/All/D0788D0CE04FEC14C2258141001BF52E?OpenDocument, accessed 10 June 2017. Ministry of Defence (RoC), (2017, December), ‘Official visit by the Jordanian Lieutenant General Mahmoud A. Fraihat to Cyprus’ [in Greek]. [Press release]. Available at http://www.mod.gov.cy/mod/mod.nsf/All/3CDE6B2E65DAAE88C22581E9004659C7?OpenDocument, accessed 10 June 2017. Ministry of Defence (RoC), (2017, December 12), ‘Egyptian Defense Minister’s Official Visit - Signing of Memorandum on Aeronautical Research-Rescue’ [in Greek]. [Press release]. Available at http://www.mod.gov.cy/mod/mod.nsf/All/A50D0190A151E393C22581F400456D5F?OpenDocument, accessed 10 June 2017. Ministry of Defence (RoC), (2017, December 21), ‘Delegation from the Egyptian training ship “SHALATIN” visits the JRCC Larnaca’. Available at http://www.mod.gov.cy/mod/CJRCC.nsf/All/DF992A2DE7B5E347C22581FD004717ED?OpenDocument, accessed 10 June 2017. Ministry of Defence (RoC), (2017, December 22), ‘International Exercise Search and Rescue CYPEGYP - 02/17’ [in Greek]. [Press release]. Available at: http://www.mod.gov.cy/mod/mod.nsf/All/C1F7F8ED0F953E02C2258204001FB48F?OpenDocument, accessed 10 June 2017. Ministry of Defence (United Kingdom) (1998) Strategic Defence Review Modern Forces For The Modern World, London: Ministry of Defence. Ministry of Defence (United Kingdom) (2000) Defence Diplomacy Paper, London: Ministry of Defence. Ministry of Foreign Affairs (RoC), (2008, January 16) ‘Cyprus and Lebanon sign an agreement on Aeronautical and Maritime Search and Rescue’. [Press Release]. Available at http://www.mfa.gov.cy/mfa/mfa2016.nsf/All/412081E0FA216C46C2257FA000458A4D?OpenDocument, accessed 10 June 2017. Ministry of Foreign Affairs (RoC), (2016, October 19) ‘Exclusive Economic Zone and Continental Shelf ’. [Press release]. Available at http://www.mfa.gov.cy/mfa/mfa2016.nsf/mfa86_en/mfa86_en?OpenDocument, accessed 10 June 2017. Muthanna, Brig K. A. (2011) ‘Military Diplomacy’, Perspectives, Vol. 5, No. 1: 1-15. Psyllides, G., (2018, September 2018) ‘Cyprus, Egypt sign gas pipeline agreement’. Cyprus Mail. Available at https://cyprus-mail.com/2018/09/19/cyprus-egypt-sign-gas-pipelineagreement/, accessed 20 December 2018. Stergiou, A, (2013, December 4) ‘Greece, Cyprus and Israel Change the Military Balance in the Mediterranean”, Geopolitical Inteligence Service. Available at: https://www.gisreportsonline.com/greece-cyprus-and-israel-change-the-military-balance-in-themediterranean, politics,644.html, accessed 10 November 2018. Toli, F., (2011, November 2) ‘Israel’s Peres to Visit Cyprus’. Greek Reporter. Available at https://greece.greekreporter.com/2011/11/02/israels-peres-to-visit-cyprus/, accessed 1 May 2017. Turner, K., (2014, November 1) ‘Cyprus and Israel Mount Joint Military Exercise’. Cyprus Mail. Available at: https://cyprus-mail.com/2014/02/11/cyprus-and-israel-mount-jointmilitary-exercise/, accessed 10 June 2017. Tziarras, Z., (2016) ‘Israel-Cyprus-Greece: a “Comfortable” Quasi-Alliance’. Mediterranean Politics, Vol. 20, No. 13: 407–427Vreÿ, F. and Michelle, N. (2009). ‘Employing armed forces: the rise of more constructive and ethical secondary roles’. Politeia, Vol. 28, No. 3: 22-40. Winger, G., (2014) ‘The Velvet Gauntlet: A Theory of Defence Diplomacy’, in Lisiak A. & Smolenski N. (eds), What do I do?. Vienna: IWM Junior Visiting Fellows’ Conferences, Vol. Zoupaniotis, A. (2017, April 12) ‘Cyprus Defence Minister meets Egyptian President’. CNA.org.cy. Available at http://www.cna.org.cy/webnews-en.aspx?a=b202944eba10483aafff99bf04b54609, accessed 10 June 2017.